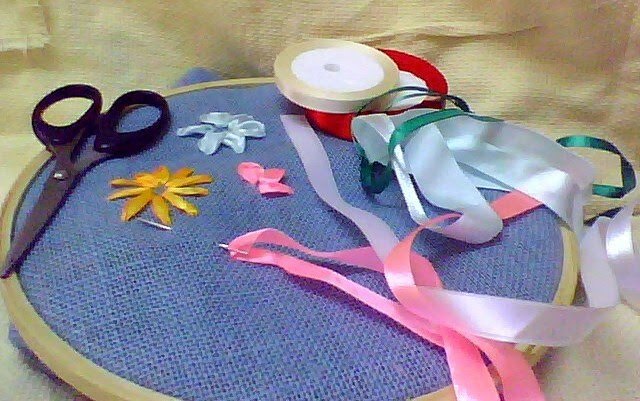 My next project is Silk Ribbon Embroidery (SRE). The beautiful rich colorful look has hooked me. I bought a whole lot of ribbons yesterday from the local market after showing a sample which I untied from one of my packed candles ! 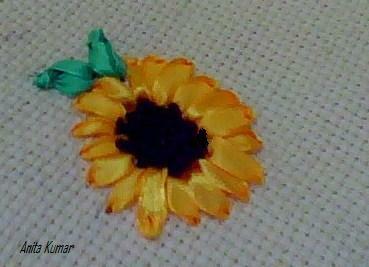 I managed to make a sunflower with ribbon stitch and french knots on matty cloth which I had with me.I also used the big needle used for cross-stitch or sewing woolen sweaters. Actually SRE is quite easy if one has done embroidery at any time as the basic stitches are the same. Instead of threads, ribbons are used . Its done on matty or aida cloth or any cloth through which with chennile or tapestry needle can pass through.Silk ribbons of 2mm, 4mm,or 7mm are generally used. Frocks, cushions, bed-sheets, saris, salwar suits , tablecloths , napkins, teacosy covers and many more things can be made gorgeous with SRE.It can also be framed. The color of the ribbons should be tested as they should not bleed when washed. But if one is making a framed piece then it doesnt matter. Also can I use regular satin ribbons (which we use to tie bows on gifts etc) for this embroidery? Your inputs will be really helpful.